It was Labor Day 2015 when Rosetta Ivey-Foster, a 67-year-old retired bank clerk, learned first-hand how quickly diabetes can deteriorate vision. Swift action restored most of her eyesight. Diagnosed with type 1 diabetes more than 25 years ago, Ivey-Foster had carefully managed her disease. That included getting regular comprehensive dilated eye exams to detect early signs of diabetic eye disease, a group of conditions that includes diabetic retinopathy, cataract, and glaucoma. The National Eye Institute recommends that people with diabetes get a dilated eye exam at least once a year to detect early signs of diabetic eye disease. A few days before Labor Day, Ivey-Foster noticed the sudden appearance of a floater in her right eye. “It looked like a blob or a water bubble,” she said, noting that she’d had floaters before, but they’d always disappeared after a couple of days. This one persisted. As she sat on her balcony to watch a local Labor Day air show with a neighbor, she realized something was terribly wrong with her vision. “I couldn’t see the planes!” she said. More than 25 million Americans have diabetes, and that number may double or triple by 2050. All people with diabetes are at risk for diabetic eye disease. African Americans, American Indians/Alaska Natives, and Hispanics/Latinos are at higher risk for losing vision or going blind from diabetic eye disease. 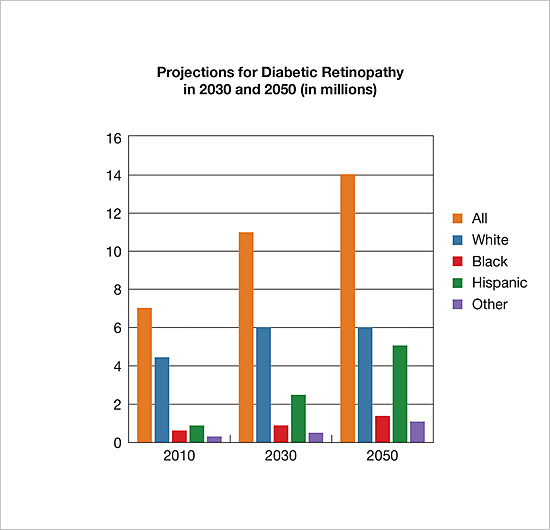 Diabetic retinopathy poses the greatest risk to vision. It is the most common cause of vision loss among people with diabetes and the most common cause of blindness among working-age Americans. Over time, high blood sugar levels from diabetes affect the tiny blood vessels in the tissue in the back of the eye called the retina. Ivey-Foster saw her eye doctor at once. Suber Huang, M.D., founder of the Retina Center of Ohio in Cleveland, discovered that Ivey-Foster could read none of the letters on the eye chart with her right eye. She had developed proliferative diabetic retinopathy, an advanced stage of the disease. New, abnormal blood vessels were growing on the surface of her retina and leaking blood—the cause of her floaters. Huang treated Ivey-Foster’s right eye with a laser to burn and shrink abnormal blood vessels in the retina. He also removed the bloody gel-like fluid in her eye and replaced it with a clear saline solution, a procedure called vitrectomy. “I was so relieved when he took the bandages off of my eye and I could see again,” Ivey-Foster exclaimed. By Labor Day 2016, Ivey-Foster had regained enough vision to again see the planes in the air show. Ivey-Foster (right) with Huang. She credits Huang with restoring her vision. “Well-controlled glycemia, or blood sugar level, has a positive, measurable, and lasting effect on eye health,” said Emily Chew, M.D., deputy director of the NEI Division of Epidemiology and Clinical Applications. In a recent study, she and colleagues found less diabetic retinopathy progression among people with type 2 diabetes who intensively controlled their blood sugar levels. “This study sends a powerful message to people with type 2 diabetes,” she said. The message also applies to people with type 1 diabetes. Ivey-Foster emphasized, “I would say to anyone that has diabetes, make sure you get regular eye exams.” In addition to early detection, her experience highlights the importance of timely treatment. Dr. Huang discussing treatments with Ivey-Foster. Today, people like Ivey-Foster have an alternative to laser therapy. In 2015, the NEI-funded Diabetic Retinopathy Clinical Research Network (DRCR.net) showed that eye injections of the anti-VEGF drug Lucentis (ranibizumab) are highly effective in treating proliferative diabetic retinopathy. VEGF is what stimulates abnormal blood vessel growth and leakage in the retina. The finding was the first major treatment advance for proliferative diabetic retinopathy in 40 years. In 2016, the DRCR.net reported results of a clinical trial that compared three anti-VEGF drugs for diabetic macular edema, a complication of diabetic retinopathy that causes the build-up of fluid in a region of the retina called the macula. The study found that Lucentis, Avastin (bevacizumab), and Eylea (aflibercept) were similarly effective when patients’ vision loss was mild. Eylea outperformed Avastin and Lucentis among patients who started treatment with moderate (20/50) or worse vision. “There has never been a more hopeful time in the treatment of diabetic retinopathy,” said Dr. Huang, a member of the DRCR.net. Dr. Huang is also chair of the Diabetic Eye Disease Subcommittee for NEI’s National Eye Health Education Program. The National Eye Health Education Program has materials and information for National Diabetes Month at https://nei.nih.gov/nehep/ndm. The NEI provides details about diabetic eye disease including diabetic retinopathy at http://www.nei.nih.gov/health/diabetic/. View an NEI video about how diabetic retinopathy can be detected through a comprehensive dilated eye exam at http://youtu.be/sQ-0RkPu35o.